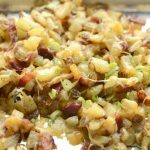 Crispy Oven Potatoes with Cheese and Bacon are the best potato side dish for any meal. Have you ever had OutBack Steak House Cheese Fries? They’re one of my favorite guilty pleasures. They’re not that good for you, but c’mon!…they taste amazing! This recipe for crispy oven potatoes with cheese and bacon taste so much like them! And the best part is that they’re made at home in your oven. You could really make these for any meal, they’d work great for breakfast, lunch or dinner, or even a late night snackfest! They get they’re crispy outside from baking away in the oven at a high temp. You’ll want to pull the pan out every 15 minutes or so and give them a good toss so they don’t stick to the pan. Tossed around in bacon fat gives them such a good flavor. These potatoes are amazing on their own, but if you love the ranch dressing that’s served with the fries at Outback, be sure to mix some up to serve with them. We love this homemade ranch recipe. For easy cleanup, completely cover the sheet pan with tin foil. Bake the bacon in the oven for about 15-20 minutes, until crispy. Remove from the oven, transfer the bacon to a paper towel lined plate to absorb the extra bacon grease. and let cool. When cooled, crumble the strips of bacon into small bacon pieces. There should be a few tablespoons of bacon grease on the baking pan, if there's too much, you can absorb some with a paper towel. 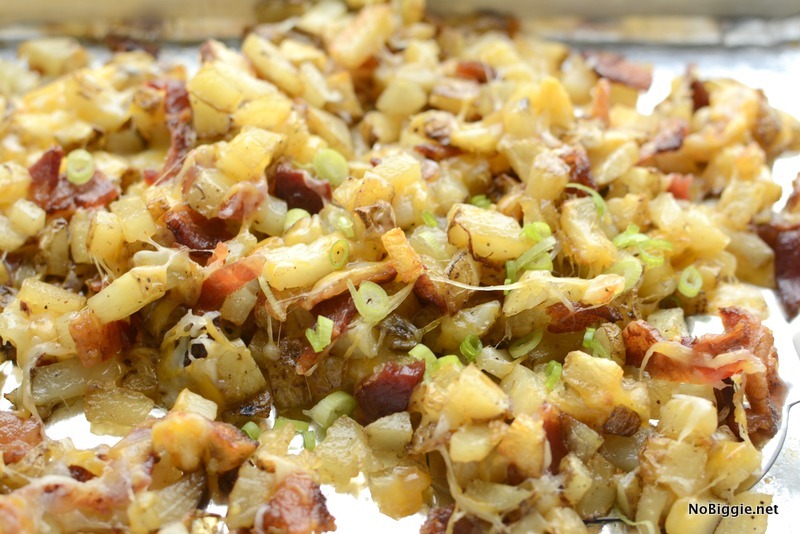 You'll need this bacon grease for the potatoes. Dice up all the potatoes. Keep a big bowl of water near your cutting board to drop the potato pieces into, to keep the cut sides of the potatoes from turning brown. 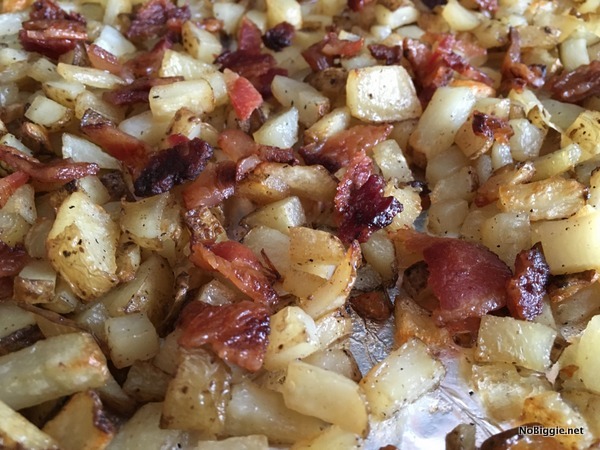 Remove the potatoes from the bowl of water and put them on the baking pan and toss them around to coat in the bacon grease. Sprinkle with salt and pepper. 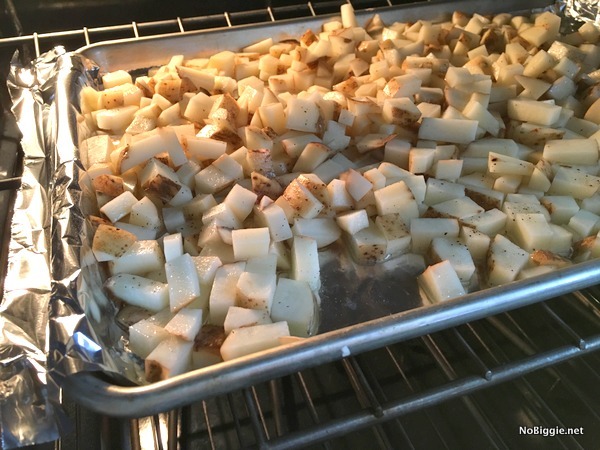 Spread the potatoes out in a single layer and bake for 20 minutes, remove from oven and toss them around again to keep them from sticking to the pan. Bake for an additional 20 minutes. Remove pan from the oven to toss around again, to make sure that none of the potatoes are sticking to the pan. 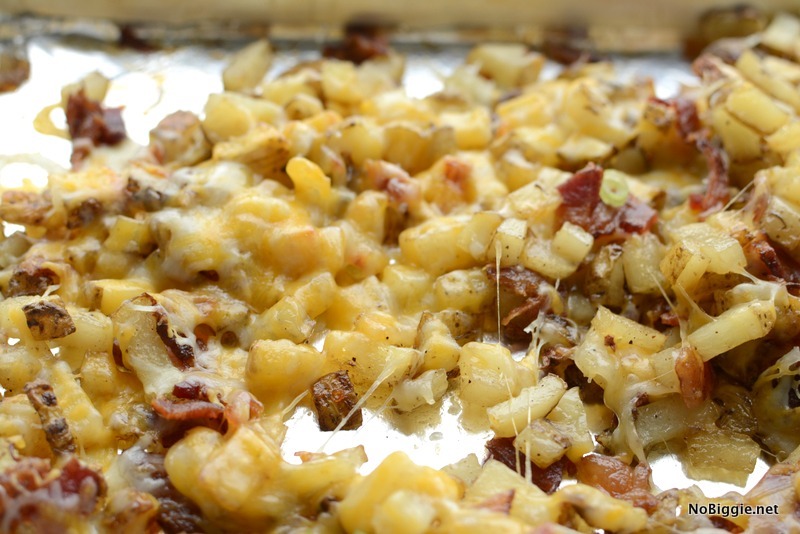 Remove the potatoes from the oven, toss again and sprinkle with grated cheese and bacon pieces. Return the baking pan back to the oven, until the cheese has melted. Garnish with sliced green onions just before serving and enjoy! I hope you love them! Have a great day!